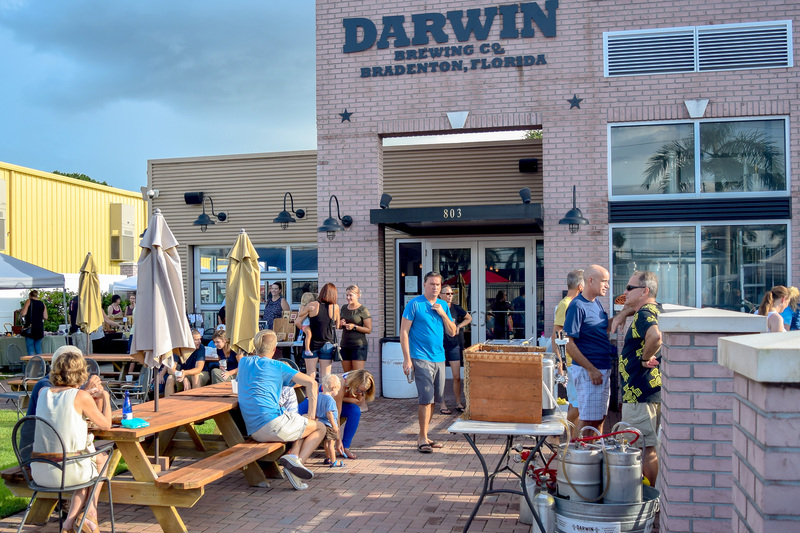 Darwin Brewing in Bradenton has been hosting the monthly Local Evolution Craft Market since Nov. 2014. Working in conjunction with Geraldson Community Farms, Darwin Brewery hosts the event on the second Friday of each month. 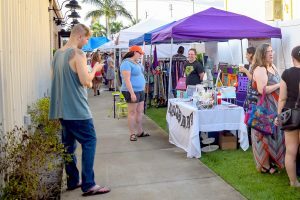 Vendors set up booths and food trucks on the grounds of the brewery and create a night-long community event where patrons can relax and shop while enjoying locally-prepared food and craft beer. Darwin’s emphasizes the use and promotion of its local community and resources. 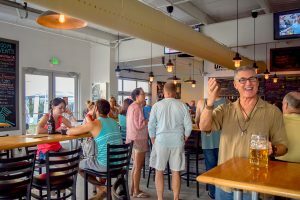 They’ve partnered with other area businesses in order to reduce waste and help cultivate each others’ mutual success. The Local Evolution Craft Market runs from 5 to 9 p.m. and features live music in a child- and dog-friendly outdoor space. 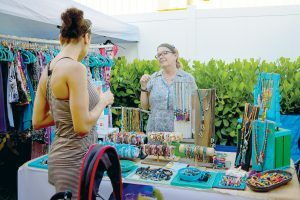 Rexy Sharp, owner of The Babe Cave, talks with a customer about her oil-infused jewelry. Rexy Sharp, owner of The Babe Cave, has been participating as a vendor for several seasons. She likes that the event provides a way to promote her business, and she also enjoys the local community atmosphere. The market offers something for everyone. 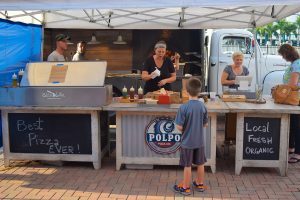 Many vendors — like the Polpo Pizza Company and Ray’s Vegan Soul — provide a limited menu of their best and most popular dishes. 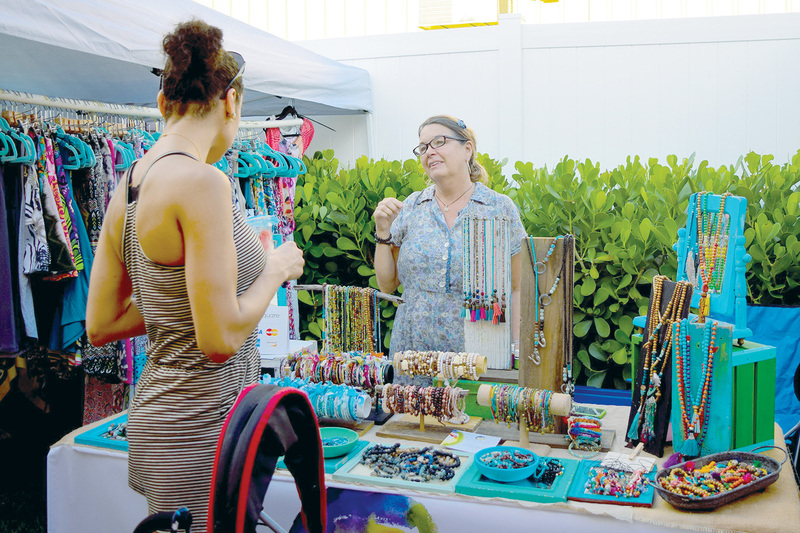 Other vendors like Sharp sell jewelry, clothing or handmade crafts, and farmers sell products like local honey. 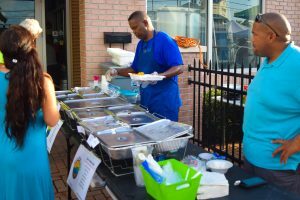 Ray’s Vegan Soul offered an all-vegan selection of favorites like “Crabless” Crab Cakes and vegan macaroni and cheese. 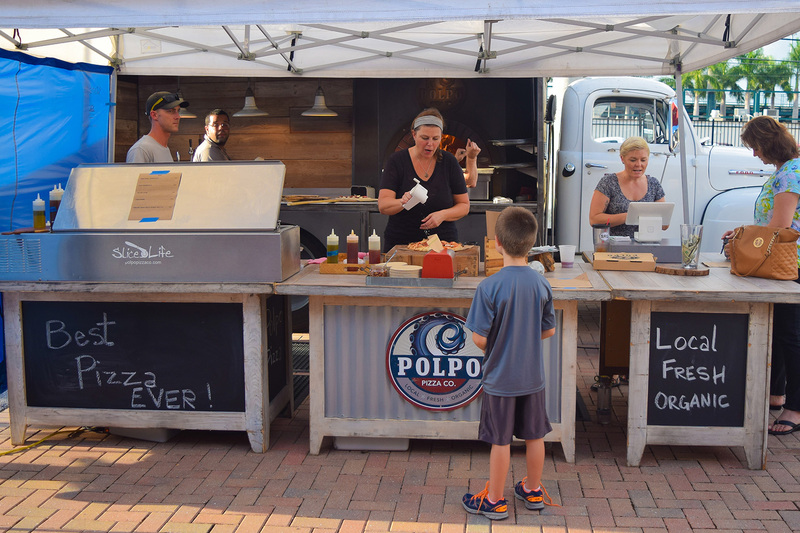 Polpo’s Pizza serves a selection of piping hot, delicious pizza from its mobile kitchen. Vendors line up outside the brewery. 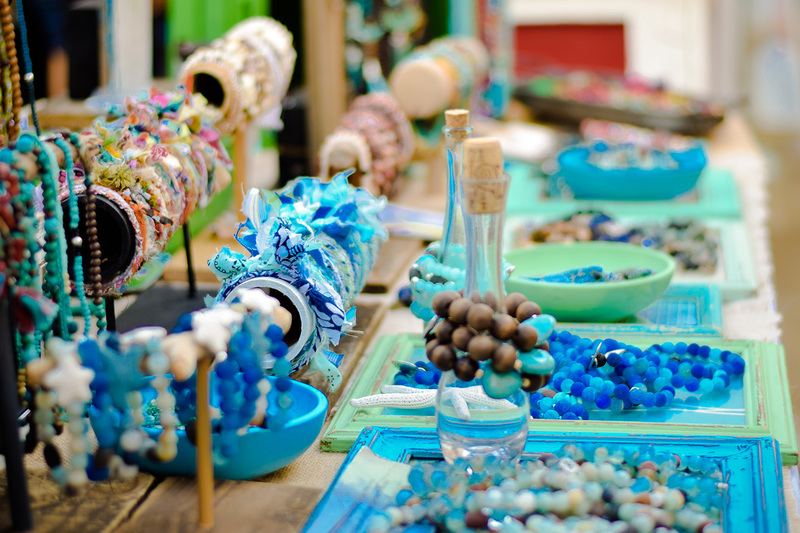 A selection of jewelry for sale at Local Evolution. 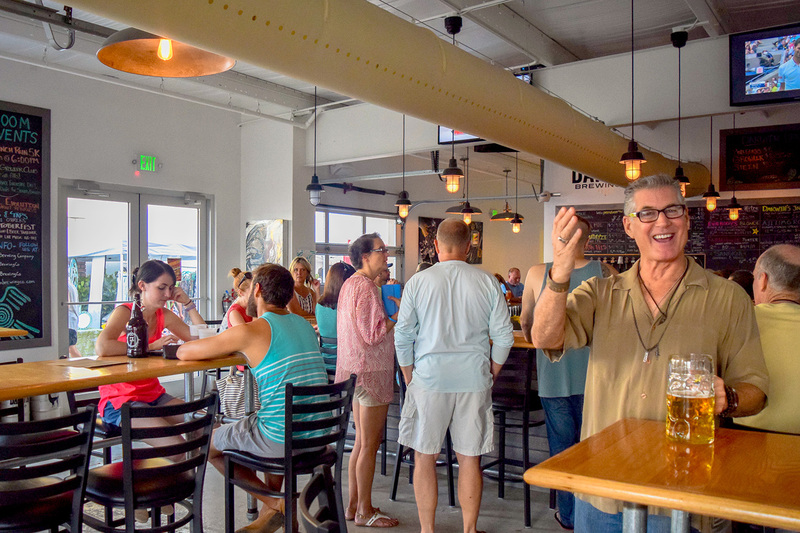 Darwin’s Brewery creates a welcoming yet upbeat modern vibe. 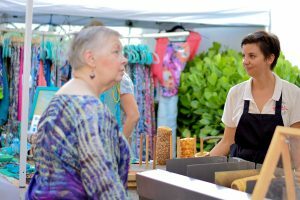 Aniko Gulyas, owner of Kurtos in Sarasota, talks with a patron about her air-baked pastries at the monthly Local Evolution.